 Clockwise from top: rose, cinnamon, pistachio and coffee. 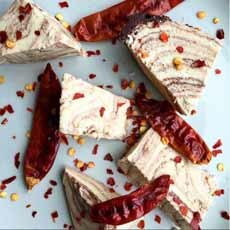 Chocolate chile halva. 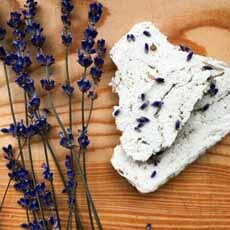 Lavender halva. From the front: chocolate orange, date, lemongrass and marble. Caffeinated, with ground coffee beans. Vanilla topped with Pop Rocks. A halva dessert plate: mixed flavors and fruits. Dessert plate of halva with dried fruit. For a special occasion cake, just add a candle. All photos courtesy Seed + Mill. 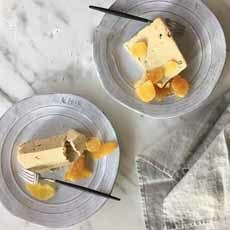 Halva versus halvah? Who cares how to spell it*, when it tastes this good. The sweet confection’s name derives from the Arabic word halwa, which means…sweet confection. 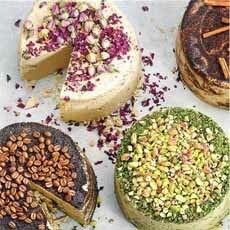 The best halva we can imagine comes from a relatively new company, Seed + Mill, founded by three friends in New York City, one of whom grew up in Israel. The company was born when the latter friend couldn’t find quality tahini in the U.S., and decided to grind her own. Fresh tahini is ground on-site at their store in Chelsea Market, New York City, and sold along with other sesame-based products. The company says that theirs is the only store in the U.S. that solely purveys sesame seed products (although we noted a frozen yogurt machine with goat’s milk yogurt). While all products are excellent, our food-life-changing experience was engendered by the sesame-based confection, halva(h). Seed + Mill makes the most ethereal, exquisite halva we can imagine—and we have been halva-deprived, for reasons we’ll explain in a bit. Seed + Mill distinguishes its products using white sesame seeds from Ethiopia, considered the world’s best. Known for their richness of flavor, they are grown in the area of Humera, a city in the northwest corner of Ethiopia, at the borders of Sudan and Eritrea. Most of the sesame used for halva and tahini sold in the U.S. is made from seeds from India and Mexico, and are not as flavorful. Hence, our disappointment with the halva available to us. Seed + Mill’s sesame seeds are shipped from Humera to Israel, where they are roasted. Some stay in for a bit in Israel, to be ground in small batches and turned into halva. Whole roasted seeds are shipped to New York, to be ground into tahini. The halva is made by small Israeli producers to the company’s specifications. The producers use ancient artisan technique—no machines, but caldrons, paddles and troughs. The sugar is boiled and whipped into a foam that produces the melting lightness of the confection. Vigorous hand-kneading produces the finest, fluffiest halvah. 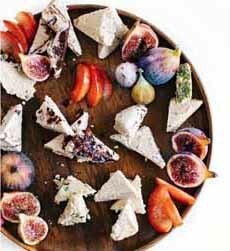 Although halva is approximately half sesame paste and half sugar, you can assuage some of the guilt with sesame’s enviable nutrition† and heart healthy fats. The confection is only mildly sweet, the opposite of fudge and American candy bars. And let us add: Seed + Mill has as much in common with halva brands like Joyva as McDonald’s has with Per Se. Even the large halva cakes sold at Zabar’s and shops on the Lower East Side have become so mediocre through the use of cheaper ingredients, that we gave up eating halvah several years ago. Some scholars suggest that an early form of halva originated before the 12th century in Byzantium, the ancient Greek colony that later became Constantinople, and now Istanbul. Evidence exists that the original was a somewhat gelatinous, grain-based dessert made with oil, flour and sugar. The first written halvah recipe appeared in the early 13th century, and included seven variations. 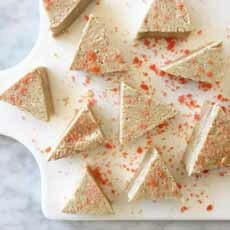 In the same period, a cookbook from Moorish Spain describes rolling out a sheet of candy made of boiled sugar, honey, sesame oil and flour; sprinkling it with rose water, sugar and ground pistachios; and covering it with a second layer of candy before cutting it into triangles. 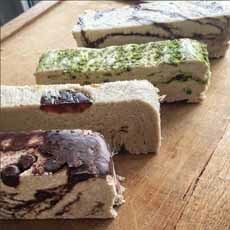 Halva spread across the Middle East to the Mediterranean, Central Asia and the Indian subcontinent. In each locale, its name and ingredients changed slightly to include regional products. Depending on local preferences, different recipes ground different seeds or nuts to make the halva. For example, Egyptians added pistachios, almonds or pine nuts. Indians flavored their halva with ghee, coconuts and dates. Flour and oil disappeared from the recipe. One recipe, made with sesame tahini, was favored by the Ottoman-ruled Romanians. Their Jewish population passed it on to Ashkenazi Jews throughout Europe. It was this sesame halva recipe that was brought to the U.S. in the early 20th century by Jewish immigrants. Halva is made when tahini (ground sesame paste) is blended with sugar at a high temperature, and then hand-stirred. The company boasts 27 flavors, including two sugar-free varieties. They’re all available online, and the retail shop in Chelsea carries about ten them at a time. Some are seasonal; for example, expect cranberry in the fall and lavender in the summer. 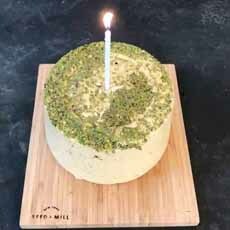 Wile many Seed + Mill flavors are vegan, about half of the flavors do include a bit of butter, which makes the halvah even lighter and melt-in-your-mouth. These are noted on the website. The non-butter flavors meet dietary preferences including dairy-free, gluten-free, paleo and vegan. If this seems like a lot of flavors, note that Suleiman the Magnificent (1520-1566), the Ottoman Empire’s longest-reigning sultan, had a special kitchen built next to his palace that was dubbed the helvahane, house of halva. It produced some 30 varieties of the confection. Seed + Mill is certified by United Kosher Supervision. You can purchase a piece as small as a quarter-pound, or order an entire halva cake. While you’re at it, treat yourself to a jar of the company’s rich, silky tahini in herb, organic and organic whole seed; and two sesame spices, mixes of sesame with salt or za’atar. Seed + Mill adapted this recipe from Ben of Havoc In The Kitchen. He found it in a Russian food magazine, where it was originally made with peanut halva. 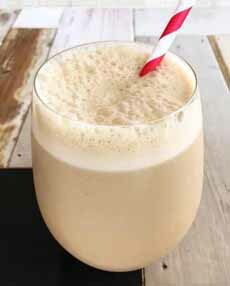 The shake-like drink does nicely as a snack, a dessert or, with the whiskey, an after-dinner drink. 1. COMBINE the coffee, halva, ice cubes and ice cream in a blender. Process for 5 minutes or until smooth and foamy. 2. STRAIN and discard the tiny pieces of halva and the coffee will be silky and smooth. 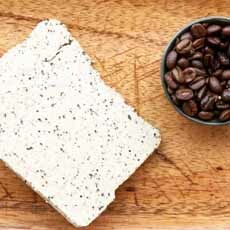 Serve halva iced coffee with alone or with halva dessert plate. 3. RINSE the bowl of the blender, return the strained coffee and blend for another 2 minutes and to foam. *The word is transliterated from Arabic, so either halva or halvah is correct. †Sesame seeds are one of the world’s healthiest foods. Here’s a nutrition profile.